Credit: Nicola Costantino, ‘Rapsodia inconclusa [Unfinished Rhapsody]: Eva el espejo [Eva the Mirror]’, installation Argentina Pavilion: Eva - Argentina, 55th Venice Biennale 2013. Copyright the artist, reproduced with permission. The 55th International Art Exhibition, commonly known as the Venice Biennale, takes as its title this year The Encyclopaedic Palace - a theme full of the promise of universal inclusion. All the more so when we learn that the curator Massimiliano Gioni’s inspiration was the work of Italo-American self-taught artist Marino Auriti who, in the 1950s, conceived of an imaginary museum that was meant to house all worldly knowledge, bringing together the greatest discoveries of the human race, from the wheel to the satellite. His large wooden model for his proposed Encyclopaedic Palace was exhibited in the Biennale’s main exhibition hall and contains quotes offering good advice written around the outside of the building (‘Watch that you don’t become greedy with your profits’ is my favourite, seeming particularly apt in an era of failed banks). Given this theme therefore, I couldn’t help but feel it was rather a missed opportunity that the curator chose not to confront more boldly the reality of contemporary life by including art that engages with the ICT age, addresses the fact that large amounts of visual imagery reaches us mediated through screens, nor be informed by the increasingly virtual experience of our lives today - lived online, through social networking and so on. I found only one piece with reference to this (and it was a historic one), a video montage of pioneering early computer-generated film clips by Stan VanDerBeek, which sadly missed out being properly contextualised. However, elsewhere in the National Pavilions (venues curated individually by the 88 participating countries themselves), things improved with the Argentine artist Nicola Costantino creating an installation that used digital video to speak of a nation’s continuing attempts to make sense of a turbulent 20thC political history. At the heart of this work is the controversial and emotionally-charged character of Eva Perón, the First Lady of Argentina from 1946 until her death in 1952. In the exhibition the space represented is Eva’s house, where she is seen performing daily tasks at different moments of her life. There are various depictions of Eva’s living together in distinct time layers, though they appear here simultaneously. 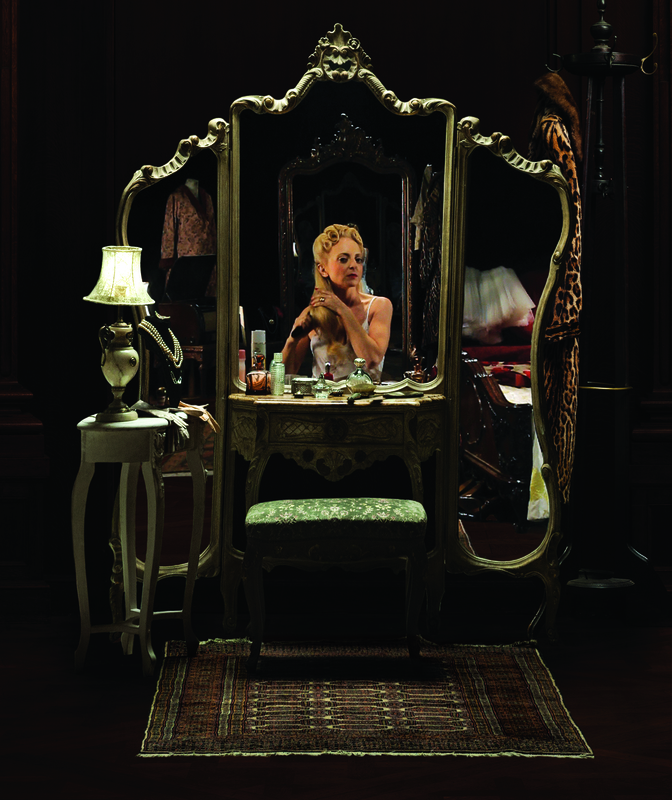 ‘Eva el espejo [Eva the Mirror]’, a detail of which is shown here, is the animated reflection of an intimate scene - Eva the actress getting ready to go on stage. We walk into her furnished bedroom, see her in the dressing-table mirror and, where our own reflection would normally be, we watch as she repeatedly makes-up her hair style and then combs it out, over and over again. A preparation for an appearance that never arrives. With a background in sculpture this Buenos Aires-based artist constantly seeks to incorporate new materials and processes in her practice, for example the study of mechanical engineering and taxidermy. ‘Unfinished Rhapsody’ addresses the challenge of how to represent such a potent myth that has been constrained by historic paradigms from a country that has been subject to military coups, political instability and periodic economic crisis. Through its charged subject matter of the person of Eva Perón, this work also confronts issues of the female body and representations of femininity. Several years after her untimely death from cancer, Eva’s embalmed body disappeared in the coup that forced her husband into exile. Some believed its removal from Argentina was part of a systematic attempt to erase Peronism from the country, as Eva was the movement’s most powerful symbol - advocate of women’s suffrage, championing labour rights and welfare reforms. Now she is remembered as ‘Saint Evita’ and is part of international popular culture, through the musical and Hollywood film. Without making any moral pronouncements, Nicola Costantino encourages us to re-consider one the most emblematic figures in 20th century South American history, within Argentina’s own Pavilion and to my mind this is the Venice Biennale at its very best. The Biennale runs until 24 November 2013 in various venues throughout the city of Venice. Catherine Mason is the author of A Computer in the Art Room: the origins of British computer arts 1950-80, published in 2008.